Highs Saturday will climb into the low 90s again for most across the metro area, but should be the last time we hit the 90 degree mark for several days. Sunday's highs will be several degrees cooler, with even cooler temperatures expected by the middle of the week. We'll see another round of storms this afternoon across the Front Range and eastern Colorado, with an even better chance for storms as we head into the coming week. 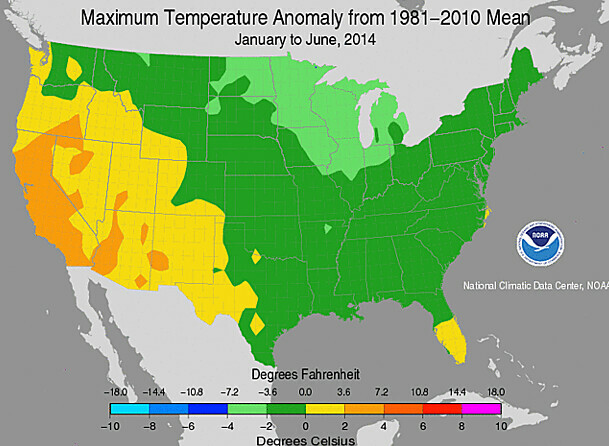 The first half of 2014 was slightly cooler than average for eastern Colorado, including Denver. However, the western half of the state balanced that out by being slightly warmer than average. Precipitation was the same balanced story. Despite a lot of snow, actual moisture accumulation was slightly wetter than average for the north, meanwhile drier than average across southern Colorado. 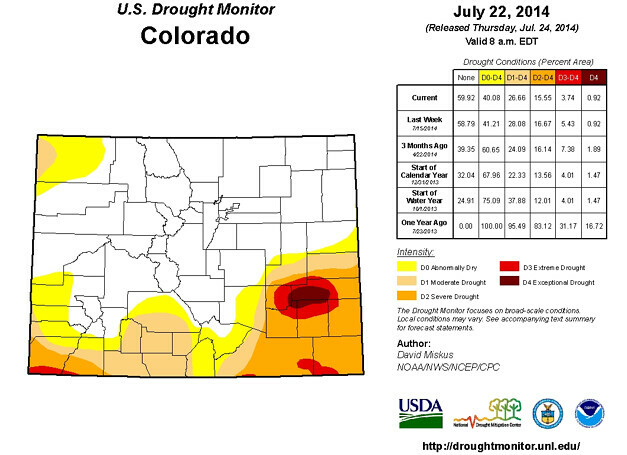 The big improvement to the drought situation in Colorado has been our consistent moisture supply this summer. As you probably have noticed, this summer has been stormier and cooler than the past few years. The stormy pattern usually takes a few weeks off in late June through late July when the monsoon kicks in. This year’s monsoon kicked in early and has been the source to all of our daily storms. The storminess has helped keep temperatures closer to average. Remember, drought feeds heatwaves. When Colorado’s water supply is low the ground is dry and that can heat the surface air more effectively. With so much moisture in the ground this year the air temperatures have been on “par”. We’ve also noted a more northwesterly flow the past several months to keep the flow of cold fronts near the region. We had a colder push of air a couple weeks ago (remember the 70s on the 16th and 17th?) that will be a very similar pattern to what is taking shape this weekend. During the weekend the persistent ridge that brought us the 90s will be breaking down slightly with a large area of energy diving south out of Canada toward the eastern US. This will drop colder temperatures in from the north starting Sunday. Rain chances continue as monsoonal humidity collides with that colder air over the state. 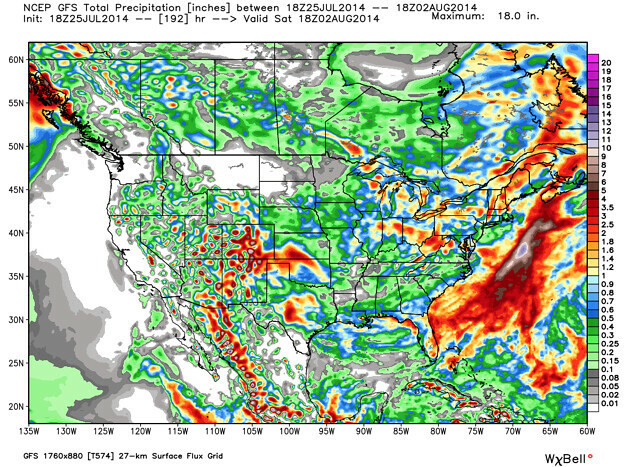 In fact, the upcoming week will bring valuable, additional rainfall. One model, the GFS, is bringing the country’s greatest moisture totals into our region, and especially those areas that need it most -- southern Colorado into New Mexico. Unfortunately more of the moisture won’t hit the western US for the sake of California’s drought and the Pacific Northwest wildfires over the coming week. 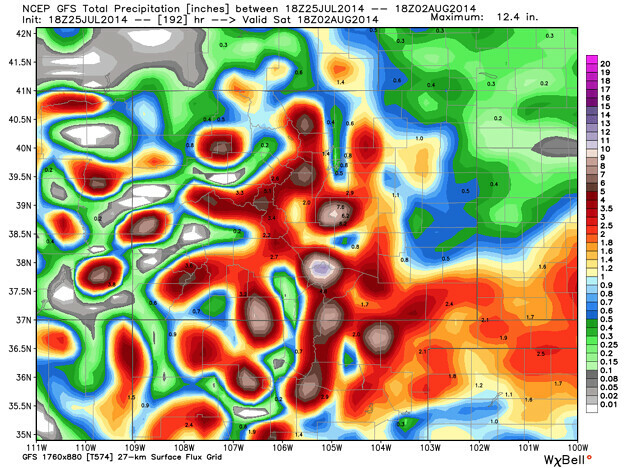 This moisture coincides with the forecast given here on Weather5280 with Brian’s last post on the monsoon. 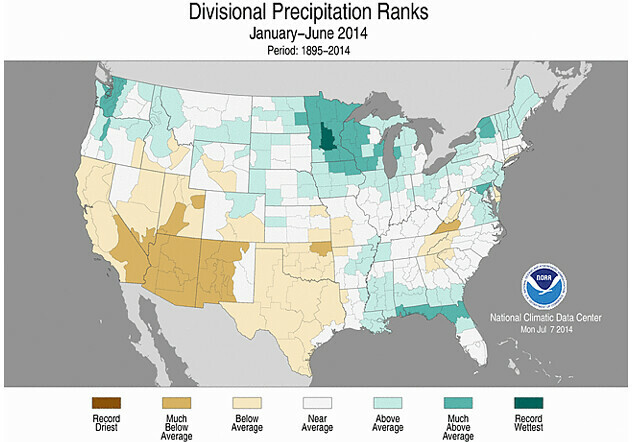 The climate projections indicated a wetter end to July and start to August. This is that projection verifying. Further, the below average temperatures also forecast are on the way. The end of July and start of August will be much cooler than average. For Denver, 70s and 80s for the week versus low 90s. As the cooler air arrives and rain chances climb we will dissect the week with a variety of posts on the system as it progresses. Subscribe to Weather5280 for email updates, and be sure to follow us on Twitter as well (@weather5280)!